It was one of the most embarrassing and humiliating moments ever in a pageant history when the host of Miss Universe Steve Harvey announced the wrong winner. 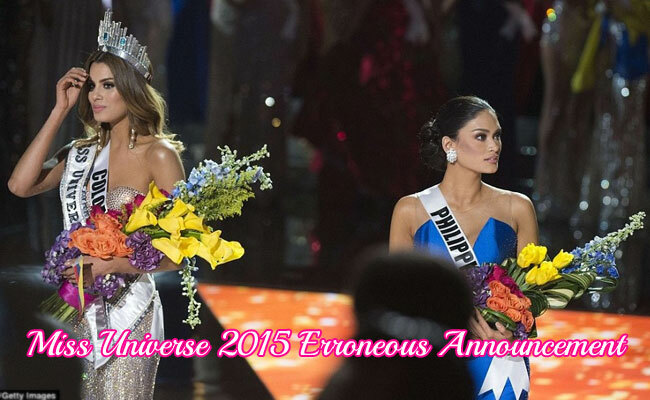 When Miss Colombia Ariadna Gutierrez Arevalo and Miss Philippines Pia Alonzo Wurtzbach were left on whose going to win the coveted title, Harvey reveal that Miss Colombia won and is already wearing the crown but minutes later he take it back and apologize to the confused audiences that the real winner is Miss Philippines. A shocked Wurtzbach then went at the front stage and Paulina Vega, last year's winner whose also from Colombia, put the crown on Miss Philippines head instead. At the press conference, Harvey called it human error and he is responsible for not reading the cue card properly where it states that Wurtzbach won and Arevalo is first- runner up. He also apologized through his twitter about his mistake where he misspelled the names of the countries on his first tweet. Even before the start of Miss Universe, it embroiled to a controversy when the former owner Donald Trump planned to sell it in September and he upset a lot of Latin's on his speech against Hispanics as he is running for president in the United States. It made Univision, a Spanish-language network and NBC to cut ties with Trump. The businessman sued the two networks last September but it was settled with NBC and he sold Miss Universe, Miss USA, and Miss Teen USA to WME-IMG. Meanwhile Colombian President Juan Manuel Santos wrote on his twitter account to cheer up Arevalo by saying she will always be their Miss Universe and the Presidential Spokesman of the Philippines Edwin Lacierda said he commend Wurtzbach for embodying Filipinas in the prestigious pageant. It could have been a very great day for the Filipinos if only there is no confusion. We can read a lot of memes about the incident instead of celebrating the win of the Philippines after 42 years. The last time the Philippines won the coveted title was 1973 by Margie Moran and before that was Gloria Diaz in 1969. I feel sorry for Miss Colombia for the humiliation she experienced and we must not blame everything to Harvey for he is just a human. Congratulations Pia Wurtzbach for the win you made Filipinos so proud.